The acrylic case is the same dimension as the wooden case and it puts together in a similar way. Please review the assembly instructions for the wood case first. 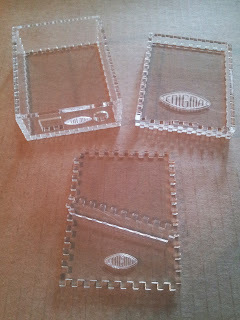 In this project we use Loctite Go2 Gel for the case and Elmer's Glue-All to attach the Merkblatt to the lid. 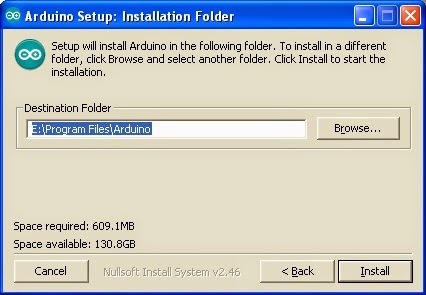 Before starting to glue the case, the Arduino must be given some standoffs first. 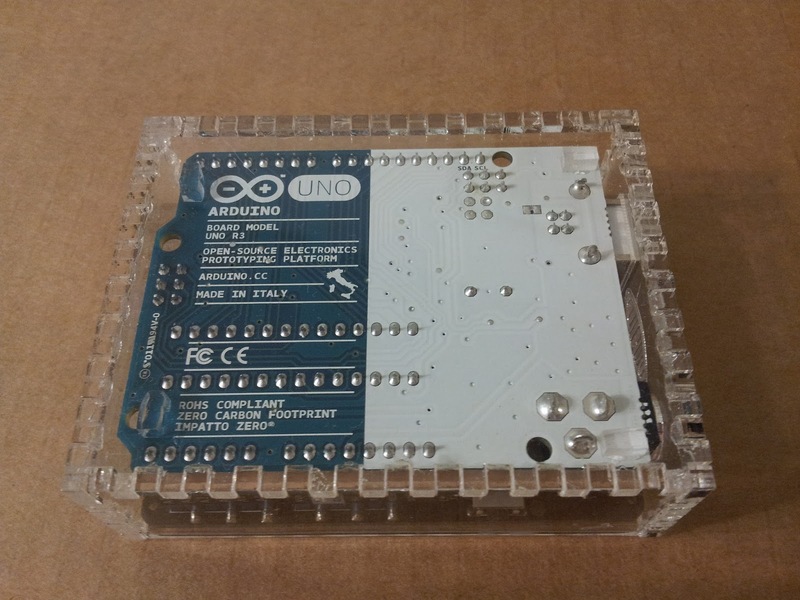 The bottom of the Arduino is not flat. 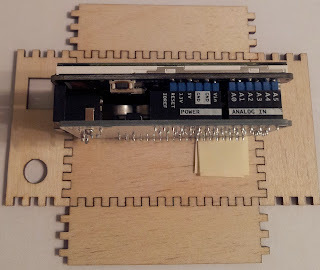 The pins for the USB and 9V Power connectors in the front are taller than the pins in the back. 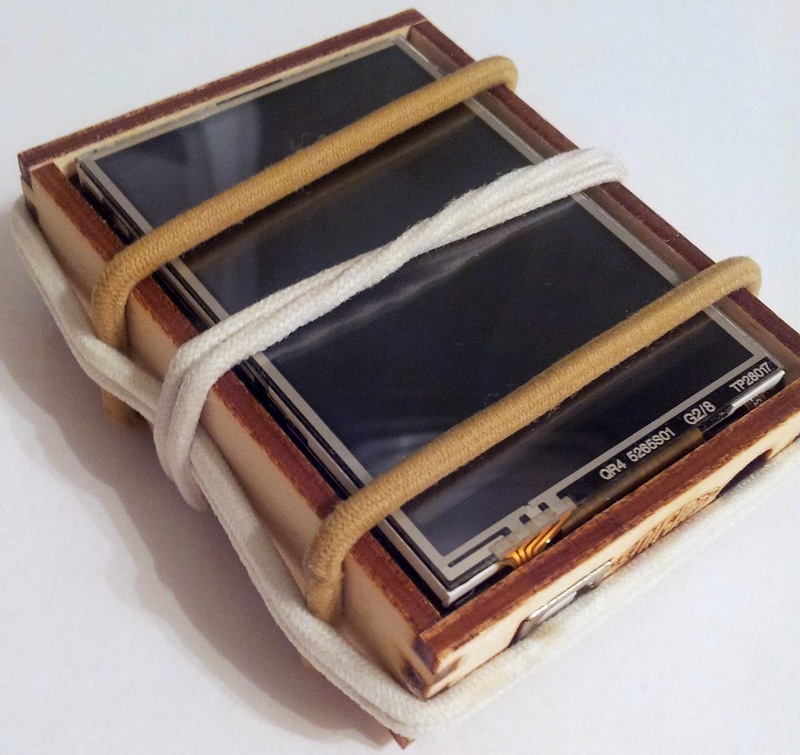 In the wooden case, a folded post-it note is used as a shim, but this solution cannot be used here because the case is transparent. The standoffs are created from the unused acrylic piece where the parts are cut from. Locate a thin piece separating the bottom lid sides and break it off. 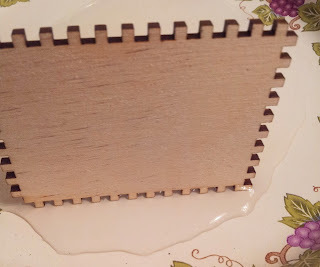 Break this part into small rectangles and sand them smooth. 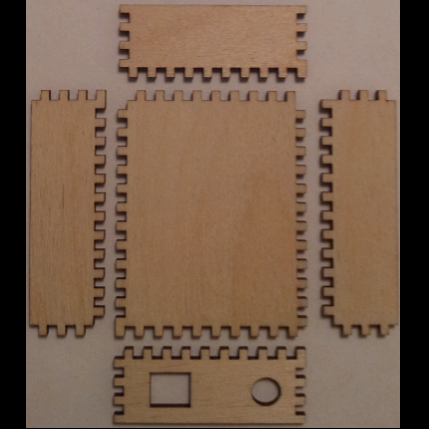 The exact dimensions of the standoff pieces are not critical because we will be using their thickness to raise the bottom of the arduino. They will be laying down on their 3mm side. 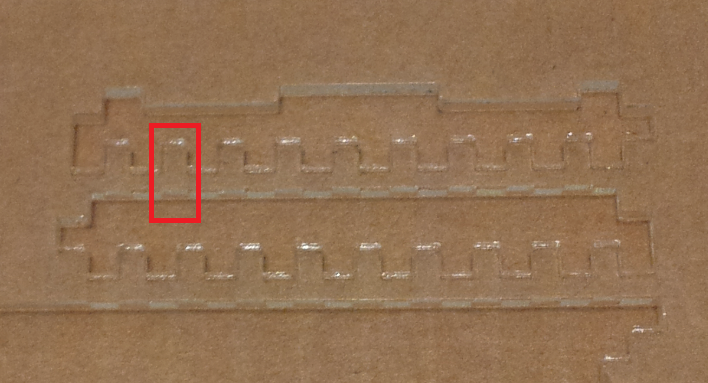 Once you have 4 standoffs, apply a little Go2 Gel to each one and glue them to the bottom of the Arduino. 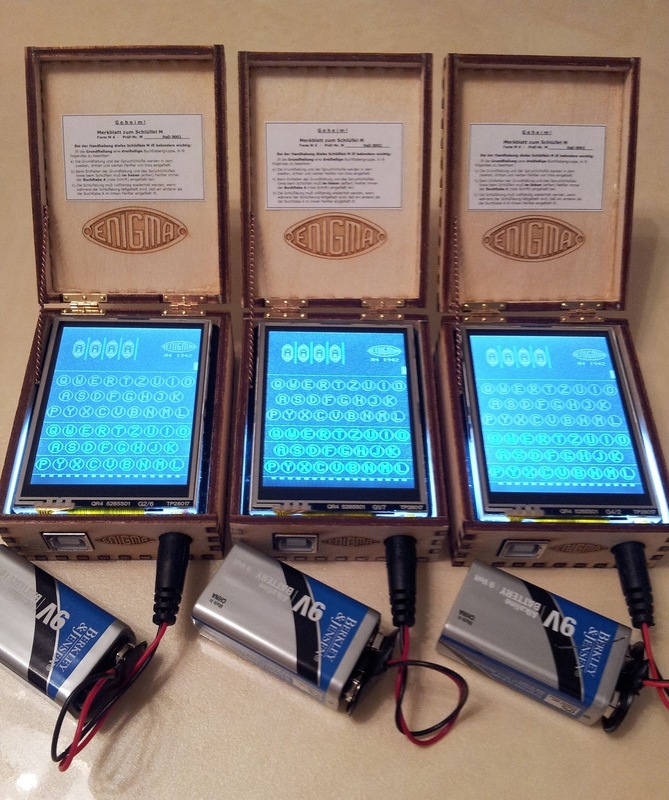 They will glue to the PCB. 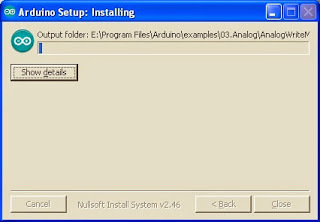 One will go to the left of the infinity arduino logo on the top left corner. 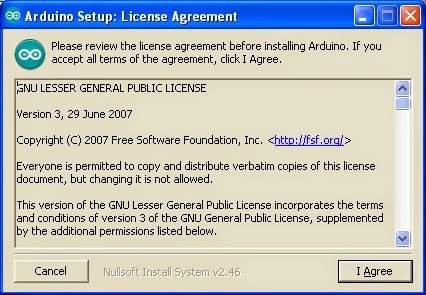 Another will go to the left of the ROHS compliant statement. The next one will go on the top right corner above the USB connector. The last one will go on the bottom right corner, clear of the power connector. Once the case is glued, apply hair bands to keep it together. 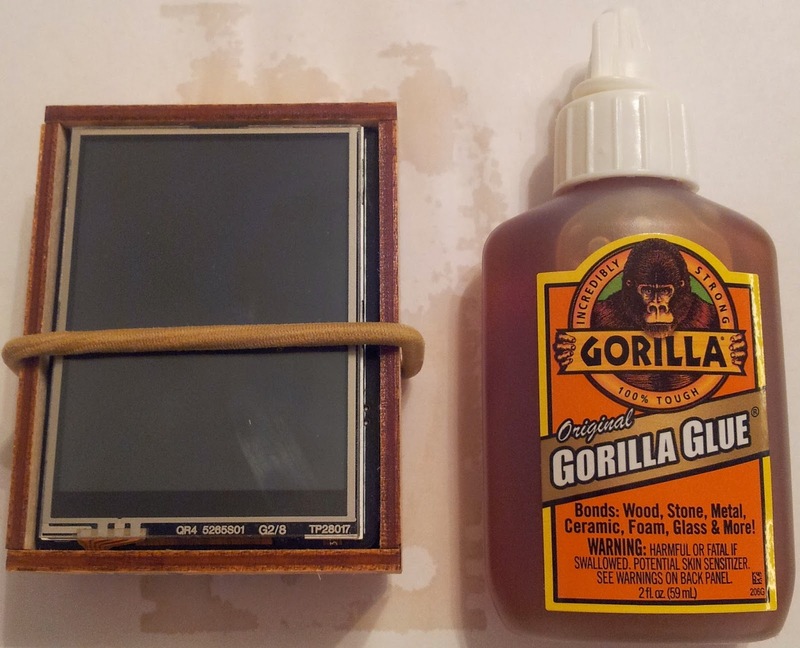 The curing period for this glue is 24 Hours. It does not melt the plastic, but it forms a strong bond. If any glue is squeezed out of the case, you can pry it off after it cures. 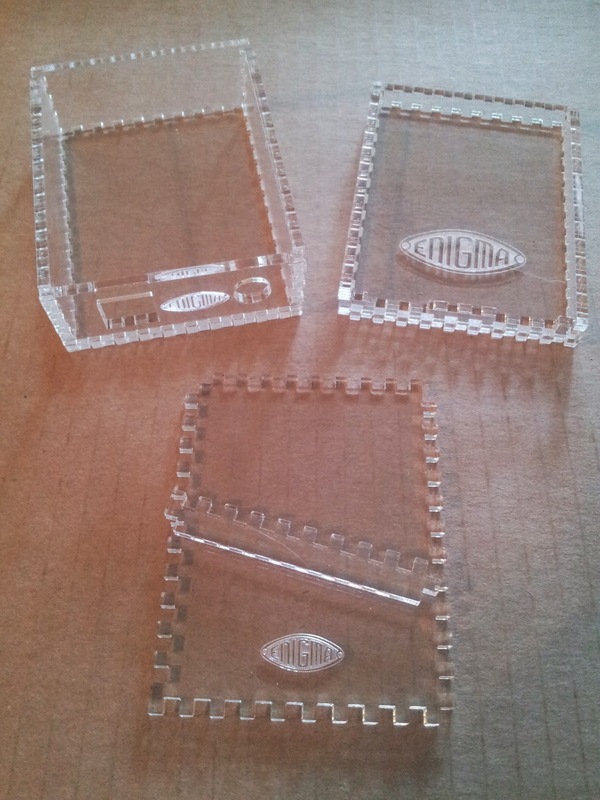 To glue the instructions to the lid, use the Elmer's Glue-All, print out an instruction sheet and cut it down to size. Apply glue to the back and place it in the lid in the desired position. The glue will show through the back, you can use the scrap piece of acrylic to practice your gluing technique. If a mistake is made, the instruction sheet and the glue can be removed by getting it wet and rubbing it off. It will remove clean and leave no trace. This case is the right dimension to accept the Housework 1131 hinges, but I have not found a way to nail the hinges to the case yet. 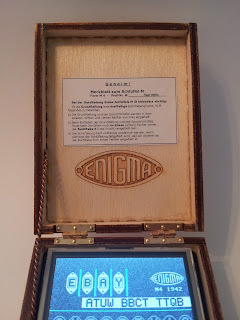 These are the specifications for the Miniature Arduino Enigma Machine Simulator. It has been called "probably the tiniest practical digital Enigma simulation." Thus, the full size B and C reflectors can be redefined (re-wired) without losing compatibility with M3 machines. You will only be able to communicate with other machines with the same reflector wiring. If this academic possibility interest you, contact us for details. 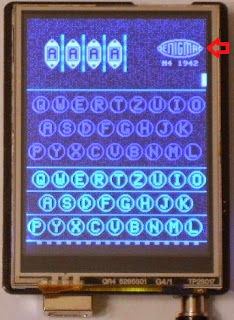 Up to 13 plugs can be installed to swap the letters as they go from the keyboard to the rotor field and also when coming out from the rotor field to the lamps. When exactly 10 plugs are installed, the Uhr switch is enabled. The plugs perform a symmetrical substitution. If a plug between A and Z is installed. if A is typed, it will be converted by the plug into a Z going into the rotors. If a letter is encoded into an A, the plug will turn it into a Z going out to the lamps. An external attachment that connected to the plugboard via 20 plugs, 10 red (a1..a10) , 10 black (b1..b10). A big dial allowed selection of 40 settings: 00..39. 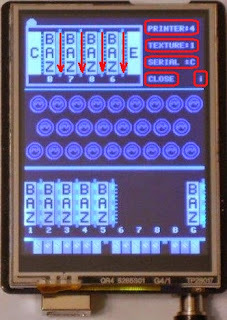 Emulates traditional plugs at setting 00, performs symmetrical substitutions at settings that were multiples of 4 (4,8,12...) and different asymmetrical substitution ie: A->Z but Z->G at all other settings. Yes, a paper tape runs in between the rotors and the lamp field, the tape can be cut by touching it's rightmost part. 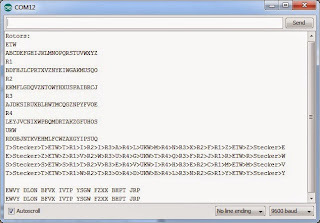 Printing groups are selectable (continuous, 4,5,6 letters). Can also be disabled for a genuine experience. 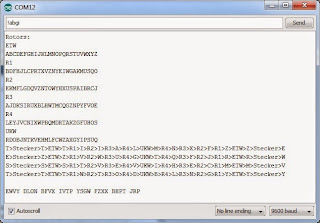 Yes, through a USB virtual serial port. 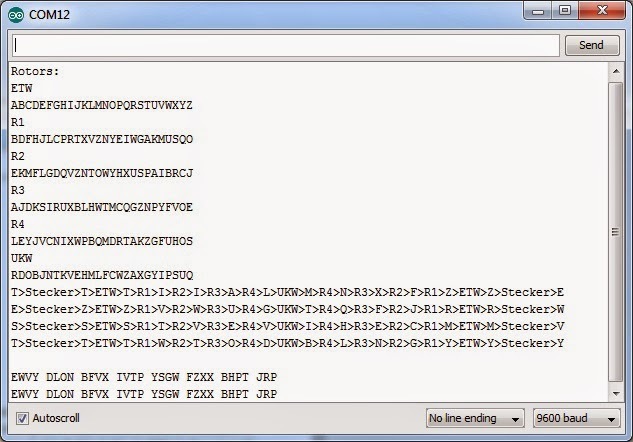 The wheel position can be set and letters sent to be encoded. 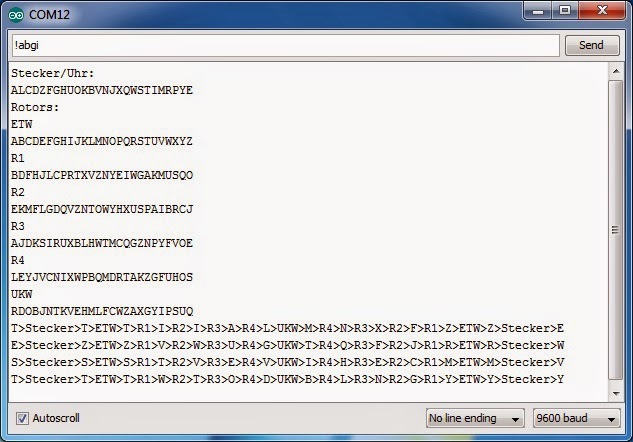 Encoded characters are printed in groups, if the printer option is set to 4, 5, or 6. 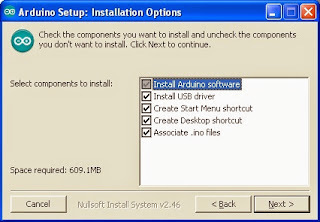 Installing the Arduino IDE and Serial Port USB Drivers. 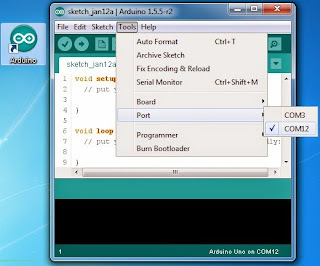 Before the Arduino Enigma Machine Simulator can be controlled from a computer, the Virtual Serial Port USB drivers must be installed. 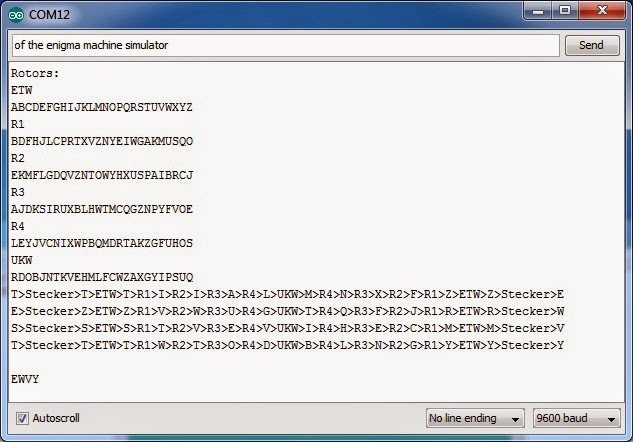 A terminal program is also needed to interact with the machine. Installing the Arduino IDE satisfies both requirements. 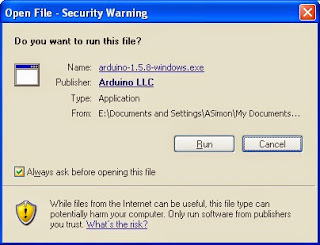 First, go to arduino.cc then click on Download. 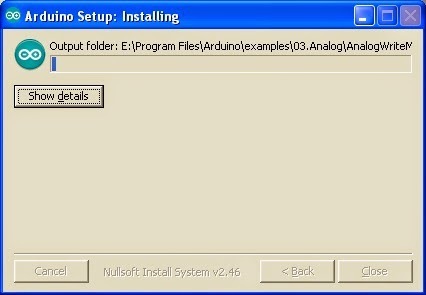 I selected the windows installer for version 1.5.8 of the IDE, then clicked on the file that was downloaded. 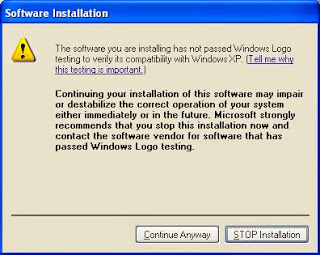 Windows throws a security warning to make sure we intend to execute this, click "Run"
Click on "I Agree" to Accept the License Agreement. 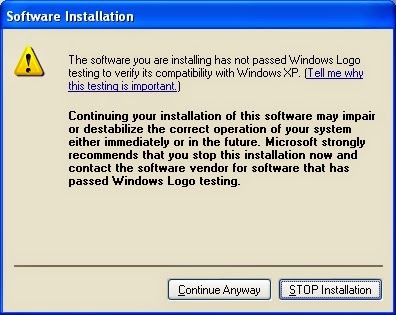 We are going to leave the default options alone. Notice the second option is install USB driver. 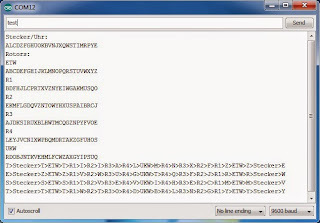 Leave the default folder alone. Windows shows the following security message before installing the USB drivers. 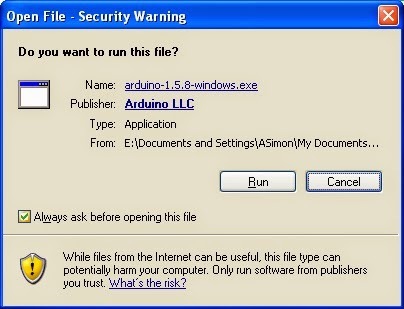 Find the Arduino icon on the desktop and double click it. 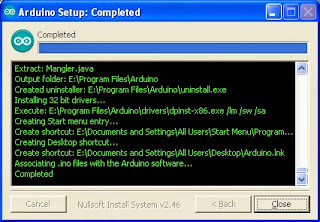 Under Tools->Port you will see the existing serial ports your computer has. 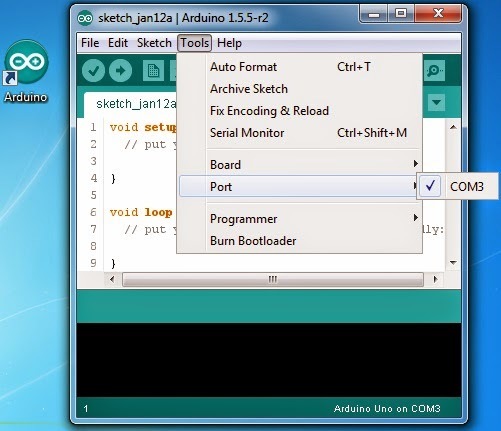 Plug the Arduino board. 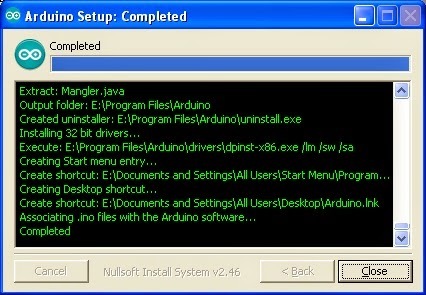 Windows will find it, install the driver and assign it a serial port. The new port for this Arduino device is shown. 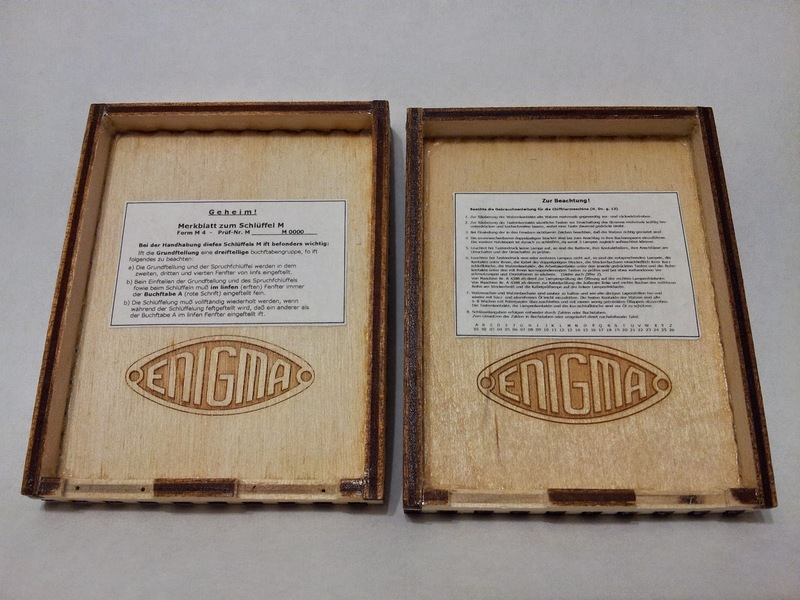 These are the assembly instructions for the laser cut wood case that comes with the Arduino Enigma Machine Simulator. Read this instruction guide completely before beginning assembly. If you have any questions, write us at the gmail address listed on the Contact section to the right of this post. -Small chain from hobby shop to hold the upper lid partially open. The first step is to take out the device from an already assembled case. To do so, the left and right joints in the front panel were cut with the saw attachment in a Leatherman Multi Tool. The whole corner does not need to be destroyed, see the left corner for the amount of material to be removed. Once the corner is cut at a 45 degree angle, the front panel will pull off. 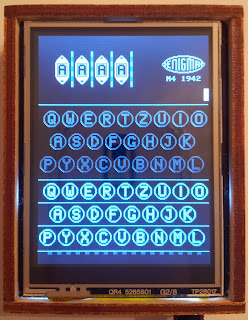 Next, arrange all the pieces for the bottom case in the correct order. The pieces can be identified by the unique shape of the corner teeth. For the bottom half of the case, use the big piece without the laser engraved logo. The two big pieces are identical. If you use the laser engraved one here, the logo will be hidden under the arduino and the inside of the top half of the case will be plain. Notice the folded post-it. 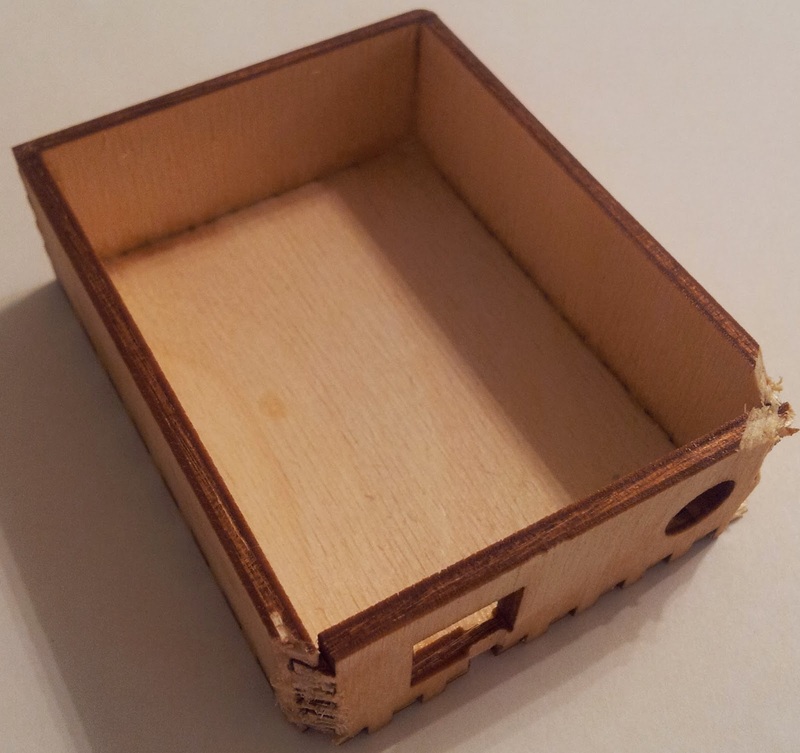 This is used to raise the rear part of the arduino so it sits level inside the case. 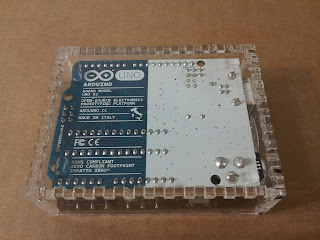 The bottom of the arduino is not flat. The USB and power connector leads stick out from the PCB farther than the header pins. 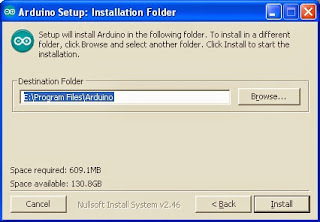 A folded post-it is used to raise the rear part of the arduino to the same height as the front. 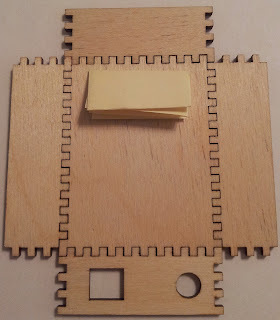 The post-it was folded in half so that the adhesive strip was on the outside and then folded in half in the other direction two times. The adhesive will keep it in place once the case is assembled. 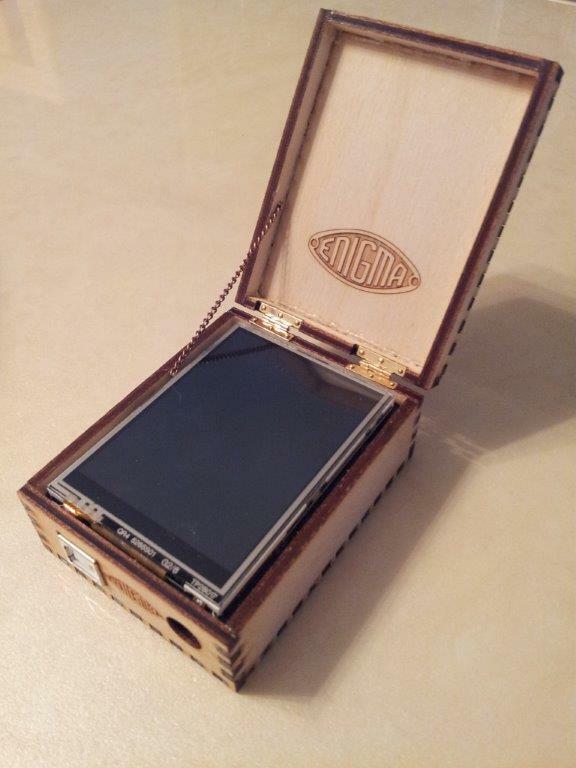 Now is the time to test-fit the case to the arduino. 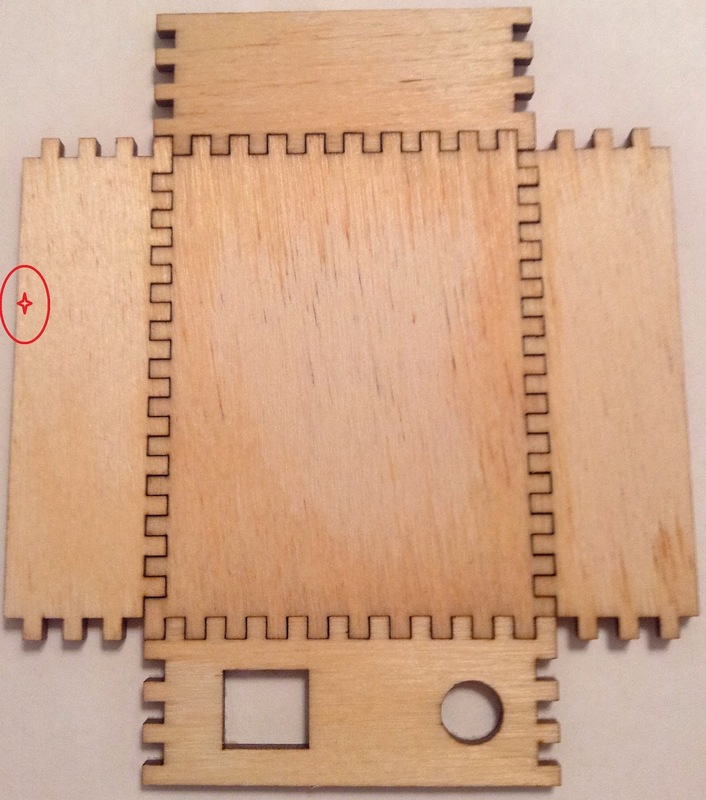 At this point, a hair band was used to squeeze the pieces in to make sure there are no gaps in the corner joints. No way to avoid the camera reflection in the glass. Can you identify the camera model? A corner shot, everything is fitting tight and neat. Next, the wood needs to be moist for the Gorilla Glue to work properly. Put enough water in a disposable plate to completely cover the teeth. 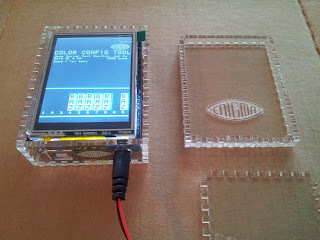 We do not want to get this whole piece wet, the arduino sits in it. 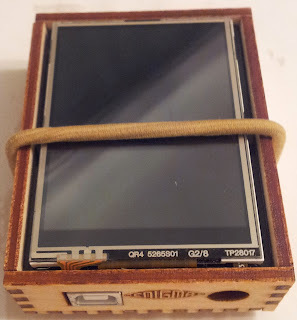 The arduino should not be powered up for at least two hours after the case is glued to allow the wood to dry. One at a time, moist all the fingers in all the pieces. Keep the fingers submerged for about 30 seconds. Tip: by scraping the wood piece against the plate while it is submerged, the laser burn marks are removed. As the pieces are wetted, they get returned back to their position. At this point, a chain will be nailed down into the left piece. 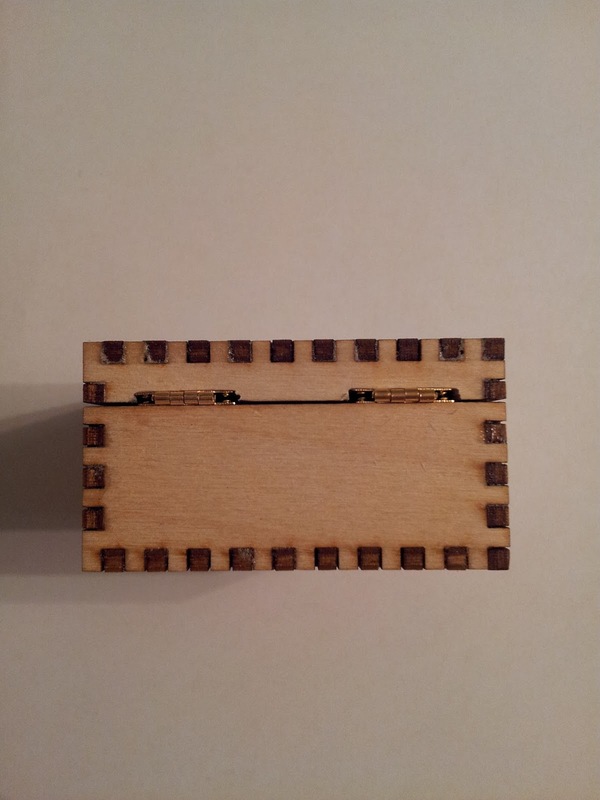 The other end will be nailed later into the upper piece and it will hold it partially open. 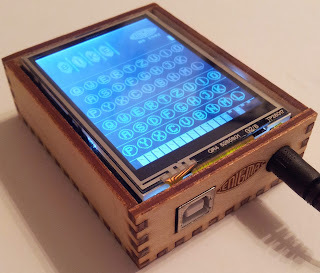 The nail needs to be above the touchscreen PCB. 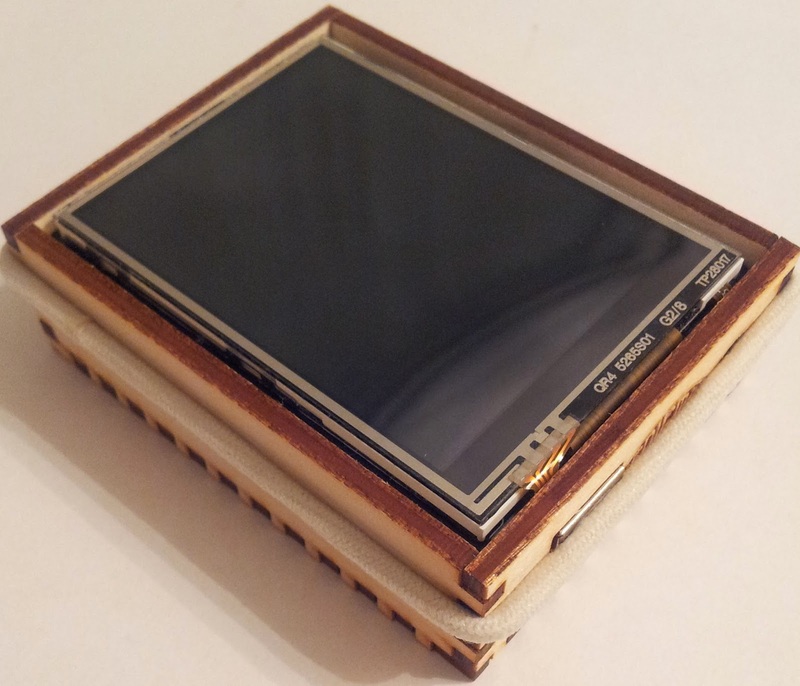 Test fit the case around the pcb to determine the depth of the pocket. The pocket has been measured to be 3.2mm deep. 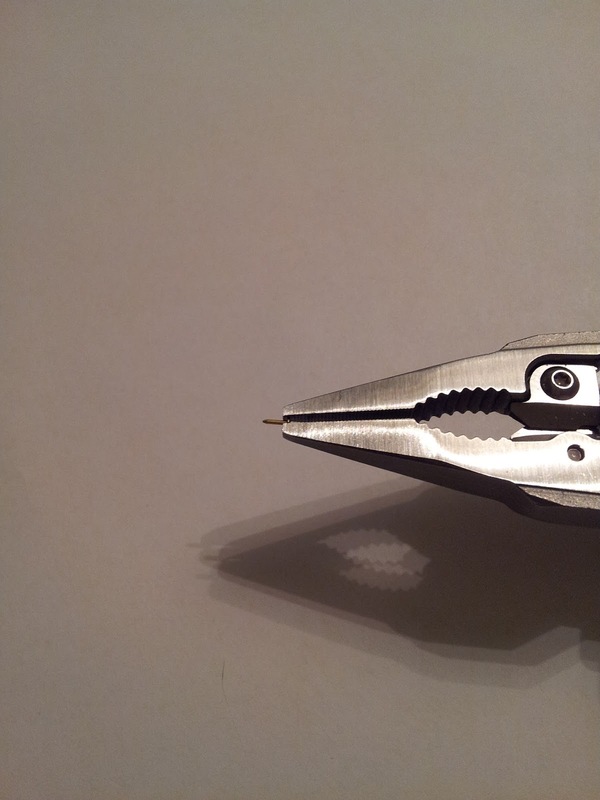 The nail can be driven 2mm to the right of the edge. The nail will go where the red star is shown on the left piece. Another test fit with the moist pieces, to ensure everything still fits. We are using Gorilla Glue. 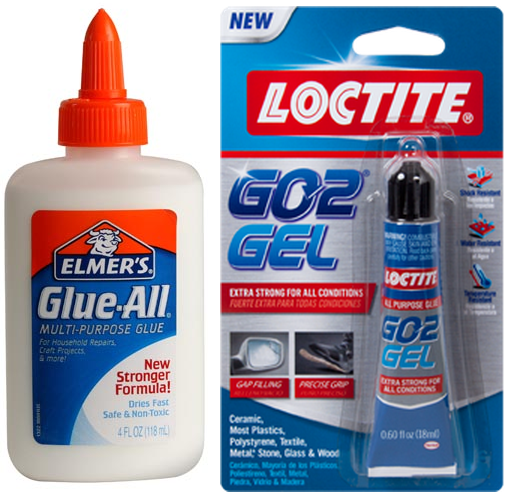 It is similar to Elmer's wood glue. They both need the surfaces to be moist to work and expand while curing. There is no going back now, apply a thin bead of glue to the inside of the teeth of the four side pieces. Do not worry about the space in between teeth, this glue expands. Do not apply glue to the bottom piece. The four side pieces will glue to it. The front panel is shown after glue is applied. The other three side pieces will look the same. As each piece is glued, put them back in their position. 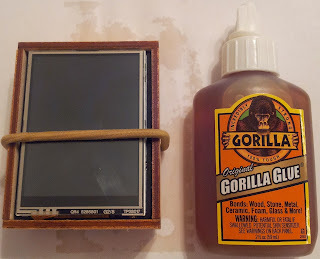 Do not get glue on the LCD screen. If the protector film is still applied, you are in good shape. If not, clean it immediately. Apply a lot of hair bands or twine to keep the case from expanding apart. 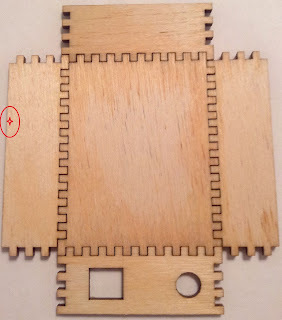 The glue will expand and try to push the joints open. Keep the case like this for two hours after the glue is applied. This will allow the glue to cure and the wood to dry. 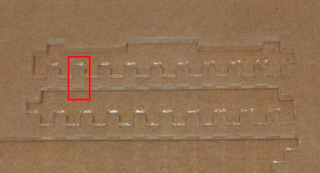 How the underside of the case looks while the glue is setting. After a minimum of two hours, the hair bands are removed. The case joints are tight and the arduino powers up. A corner shot showing the joints are tight and how the logo looks. 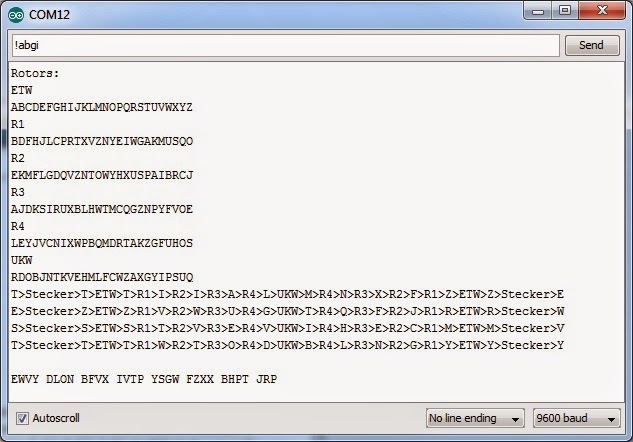 Showing how the lower case pieces fit together. 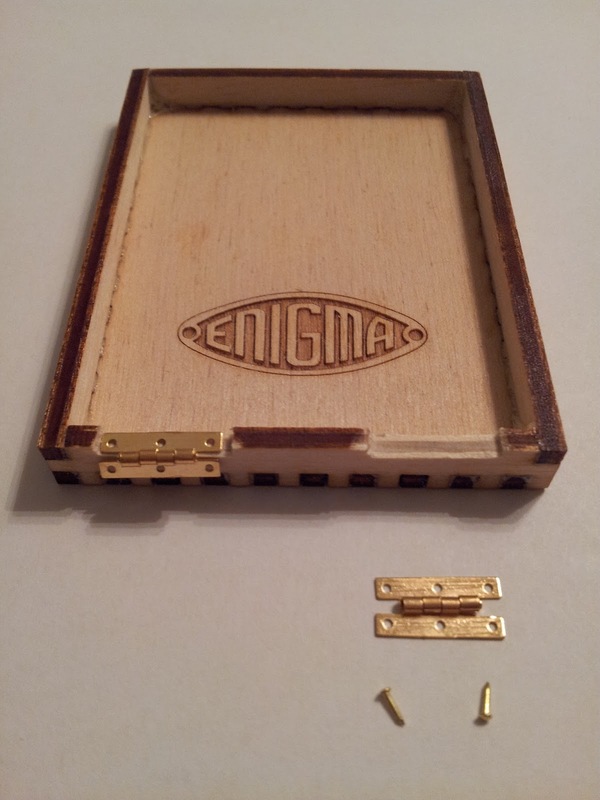 The floor plate on the lower case will have an engraved enigma logo that will be hidden from view. 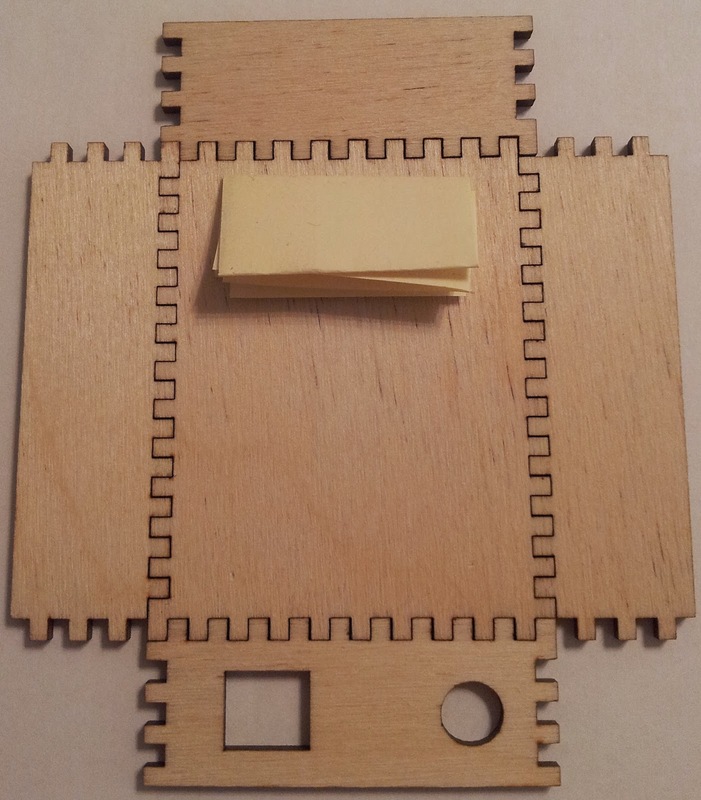 Showing how the upper pieces fit together. 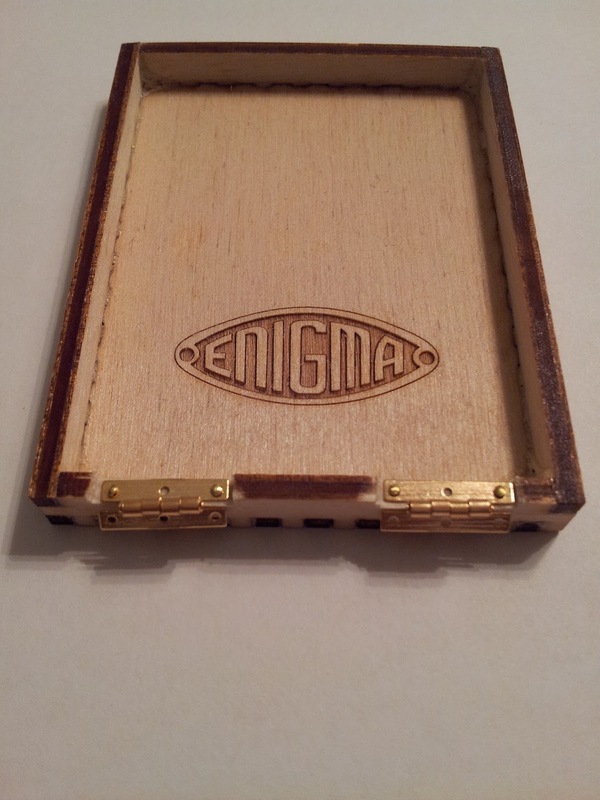 You will receive two pieces with the engraved enigma logo, one small, one large. 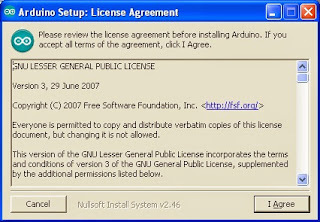 Shown here is the small logo. 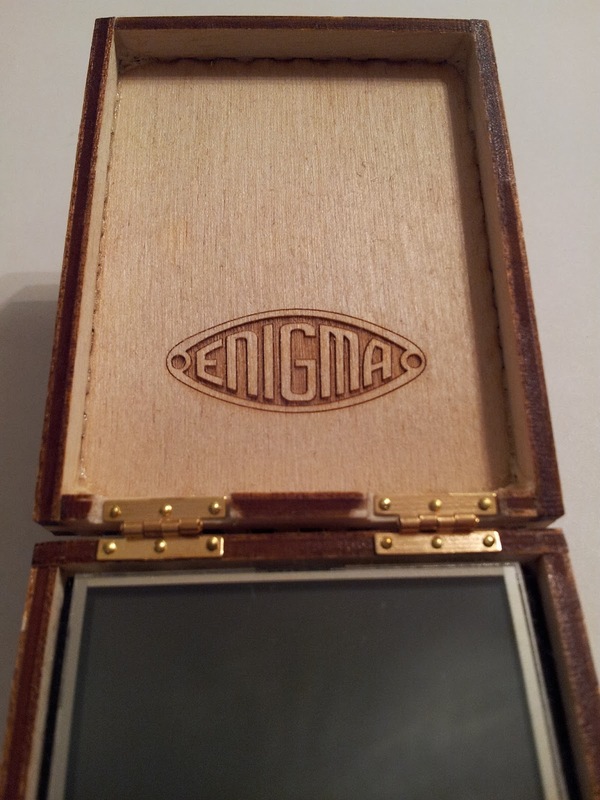 At the bottom of the post, a case with the big logo is shown. Select one that will be visible. 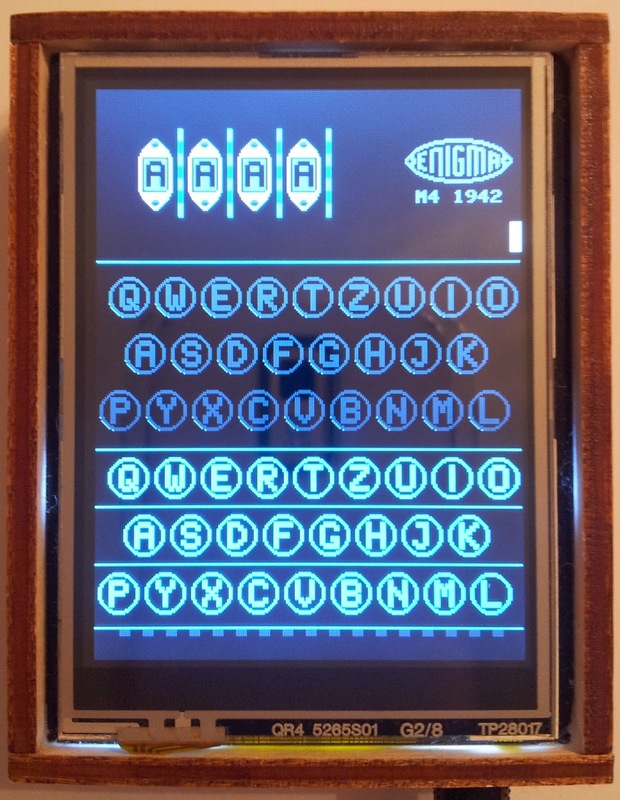 The other unwanted one will be used as the floor plate on the lower case and will be hidden. 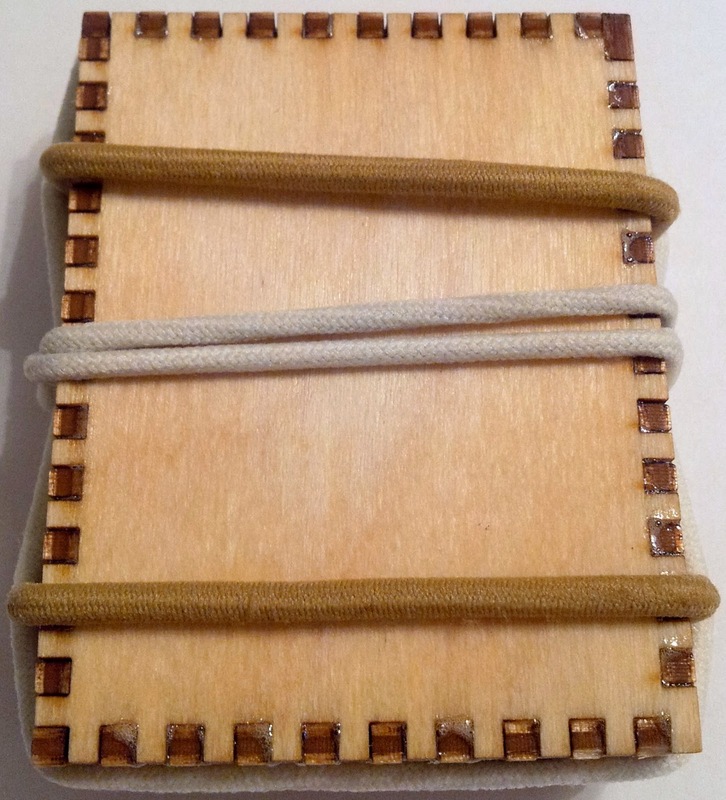 The pocket for the hinges was filed down by hand in this prototype. You will receive a laser cut piece. 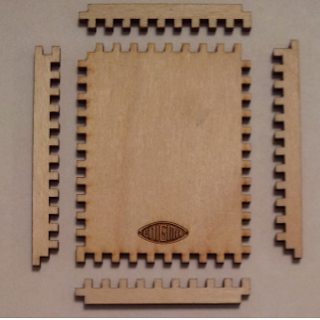 The case at the bottom of the post was assembled with all laser cut pieces. 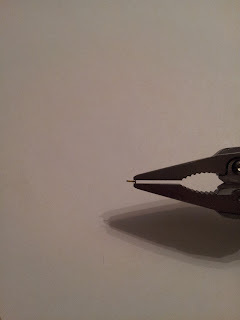 Grab a nail with some fine tip pliers. 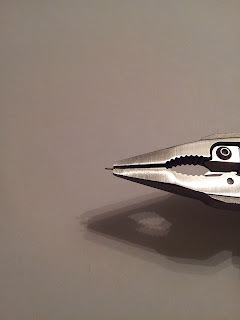 Another shot showing how the nail is held. 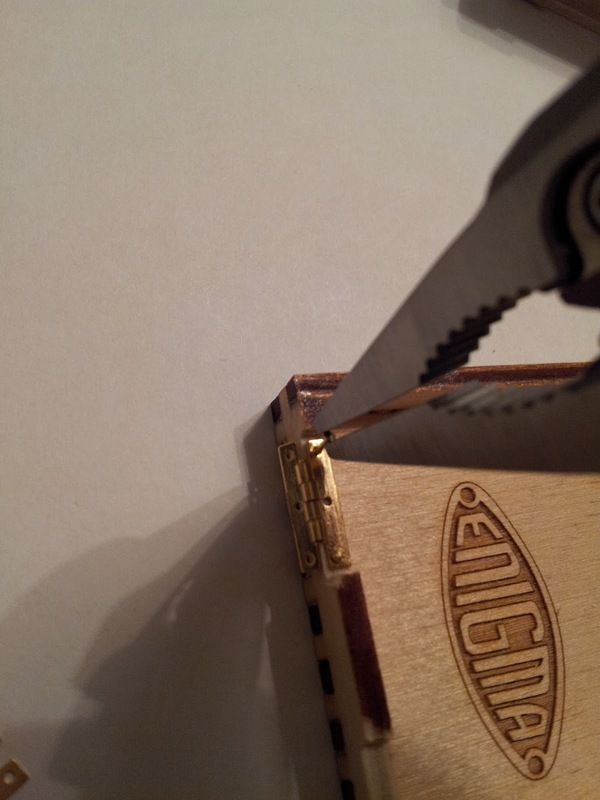 Place the hinge into the pocket and drive the nail down into the plywood. It will go into the middle layer and will go in smoothly. Be careful to drive it down vertically so it does not split the wood. The upper hinges are installed. 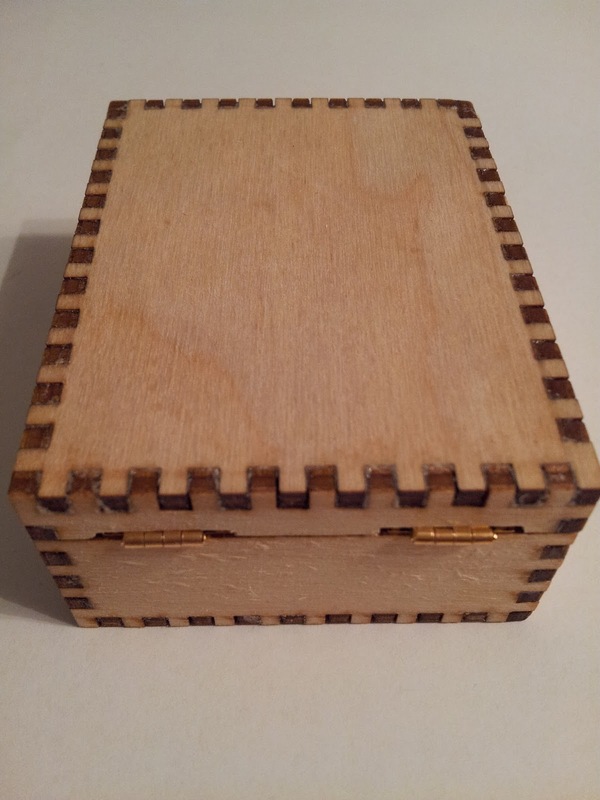 Align the top part with the bottom case and drive the nails down. 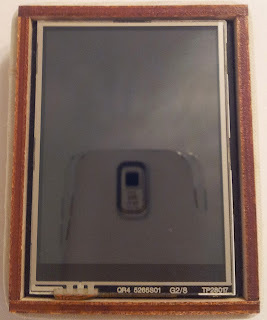 Be careful with the glass screen, protect it, The hand that is used to hold the bottom case in place can go over the screen to protect it. At this point, the other end of the chain can be nailed to the inside of the left side of the upper lid. See the bottom picture for details. 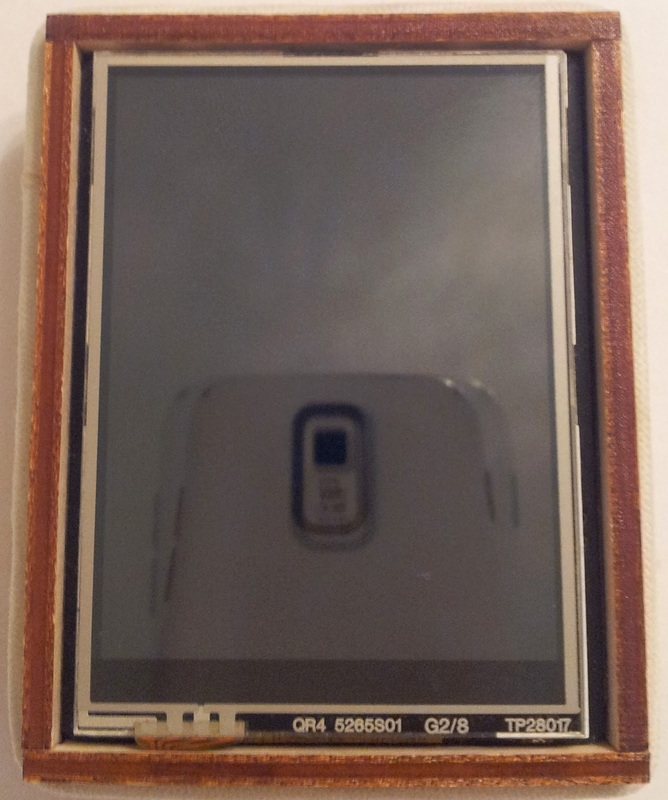 Showing the rear of the case. 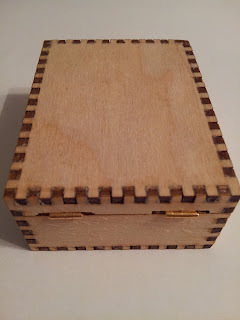 Showing how the hinges fit in a pocket and the alignment of the upper and lower pieces. 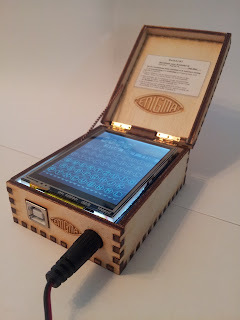 A fully assembled Arduino Enigma Simulator. The attachment point for the chain on the lower case is shown. Another assembled Enigma Simulator, serial Had 0001, entered in the Hackaday best product prize competition. This one shows the Merkblatt (Instruction sheet) glued to the inside of the upper lid. 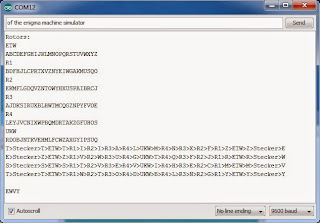 A serialized Merkblatt ships out with all simulators.